LOS ANGELES - Sometimes timing is everything. In 1999, it was time for Eugene Moscovitch to move on with his career. His heated separation from his law firm, Charleston, Revich & Williams, and wavering desire to continue on as a corporate litigator pushed him to the brink of leaving the legal practice all together - until he found a new calling as a mediator. "At the time, I was feeling somewhat disconnected and disillusioned with being an attorney and litigating," Moscovitch said. "I was very driven and it carried over to my personal life, I was litigating life, and I wasn't enjoying my family as much. I was losing perspective." So, he said, he began searching for a new career, even resorting to a two-day psychological evaluation of tests aimed at finding his next calling in life. The results came back, and despite his misgivings, they pointed in one direction - right back at the law. But, he said, rather than seek out another firm while still fighting with his last - Moscovitch had filed suit in 2000 against his former employer unhappy with the terms of his separation - he found his way through this self-described mid-life crisis in a new career as a mediator. In 2001, he even settled with Charleston Revich and said he still remains on good terms with many of his former colleagues, some of whom have even hired him to arbitrate their cases. He said his decision to join the Alternative Resolution Centers eight years ago and build a new practice from scratch was the most important of his professional life. "Though it was hard getting started, at this point it has exceeded my career as a litigator in every possible way," he said. "It's the best of both worlds. It's all the intellectual stimulation of the law but a new case with new challenges every day." After establishing himself through a few years of pro bono cases and through a warm and supportive experience working at the Alternative Resolution Centers, Moscovitch built a reputation as an expert on explaining a jury's perspective and the risk that comes with it. He also developed his own caucus style of bringing parties together without getting them in the same room. "The best way I have found to look at both sides of an issue, is not by being impartial but by being multipartial," he said. "I don't see impasse as a dirty word. That's why people come in, because they have either hit an impasse or know they will." Three years ago, it was good timing again that led him to switch mediation houses and join Alternative Dispute Resolution Services, practicing out of their Century City offices. "My experience at ARC was wonderful, but I felt as if I hit a glass ceiling, perceived or otherwise," he said of his departure. "I felt immediately at home at ADR, settled my first 18 cases straight and have tripled my business." Moscovitch, who was 52 when he switched to mediation, sees his decision to get into the business early - traditionally many mediators have been in their mid-60s and retired - as another well-paced decision. Now at 60, rather than being a rookie arbitrator in a much more crowded field, he is one of the leaders in mediation, working on an average of 150 cases a year and settling 90 percent of them. Recently, he also mediated civil rights and wrongful death cases involving the complexities of prison conditions and law enforcement in San Bernardino and all over the country. According to his clients, it's often his appreciation for the intense emotions that leads them to choose Moscovitch when they are looking for a mediator. Peter Steinberg, a name partner at Calabasas's Steinberg, Nutter & Brent, first hired Moscovitch for a mediation in 1999 from the court's pro bono panel and has seen him mature into a a mediator, "of the ilk that anything can be settled." 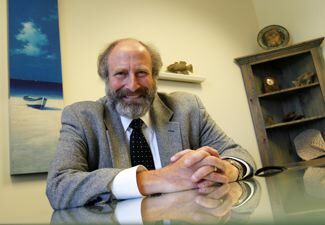 "Once I brought him a client that was so hysterical that she needed to lie down and play Tibetan meditation music as Gene tried to talk about the case to her," Steinberg said. Though Moscovitch appeared a bit startled with the situation, he displayed an exceptional "bedside" manner in the personal injury case, which settled at the defendant's insurance policy limit. It was a result that served the best interest of both sides in Steinberg's estimation. "Frequently I will not tell people numbers during the negotiation that are insulting or just meant to send a message," Moscovitch said. "I try to avoid getting into situations where the attorneys are putting on a show for their clients." Fred Griffin, a partner in the employment defence practice of Leob & Leob, has known Moscovitch for 25 years and said his understanding of a litigator's mindset ensures that cooler heads prevail. "It's like night and day," Griffin said. "The mediators with a background from the bench - and I don't use them very often - try too hard to preside. We only use them if we want someone to come in and tell us that one party is dead wrong. "Gene works from more from the human and personal perspective. He really helps your client understand that this is their last chance to have any control over an issue, because once it's in court, anything can happen." Â© 2007 The Daily Journal Corporation.